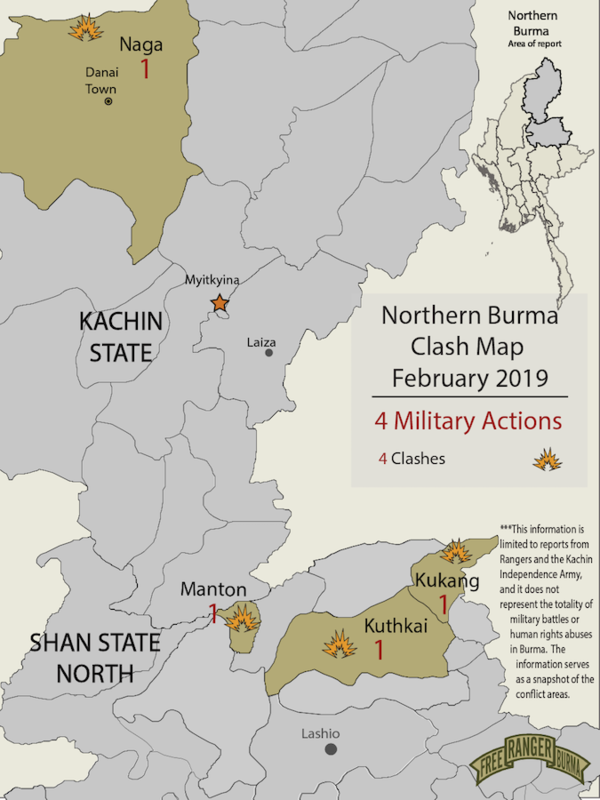 Clashes between Burma Army troops and ethnic armed groups continue, with civilians caught in between or deliberately targeted by the Burma Army. The fighting has affected several areas, Hpakant Township and the Naga Self-Administered Zone (Naga SAZ) in particular. On Feb. 4 at 1100, Myanmar Armed Police guarding the 111 Company, a mining company, opened fire on local jade hunters in Hpakant Township, wounding one of them, Kyaw Zin Hpyo. The next day, Feb. 5, Burma Army troops arrived at Daga, a village under Naga control, and murdered a 47-year-old Kachin man, Lahpai Zau Awng, whom they suspected of giving information to the Kachin Independence Army (KIA). On Feb. 8 around 2100, members of both the Myanmar Armed Police and Shanni Pyitutsit (PTT) carried out checks on civilians going to and from Kamai Village in Hpakant Township. The PTT is a militia operating under the control of the Burma Army. On Feb. 9 between 0900 and 1100, combined troops from the Myanmar National Democratic Alliance Army (MNDAA) and the Ta’ang National Liberation Army (TNLA) clashed with Burma Army troops near Manmak Village in Manton Township in northern Shan State. Manmak villagers fled to Mung Yaw Village, located south of Manmak. On Feb. 20, KIA militiamen successfully defended themselves against an offensive by Burma Army Infantry Battalion (IB) 10 under Burma Army Light Infantry Division (LID) 88 in Kuthkai Township. In retaliation, Burma Army troops burned down a house in Lai Ba Zung Village. The house belonged to Mr. Labang Naw. Additionally, on Feb. 12, MNDAA troops clashed with Burma Army LID 99 between Hawng Ai and La Bar Chai in the Kukang region. On Feb. 16, Burma Army troops attacked the Kate Armed Groups stationed at Daga Hhakhu Post in Naga SAZ, killing one Kate officer and injuring three privates. The Kate people are a minority ethnicity in Burma. Their name is pronounced Gah-TEY.